Lower Back Exercises are important for overall core strength, yet so many people neglect the lower back muscles in their core training routine. Core training involves the abdominal muscles and the lower back muscles, and performing exercises on an unstable surface can further enhance the effectiveness of core exercises. Because the Bosu Ball is slightly unstable, your lower back and core muscles will work a little harder just to maintain your stability. And, because the Bosu Ball is contoured, you will have more range of motion than if you performed these exercises on the floor. 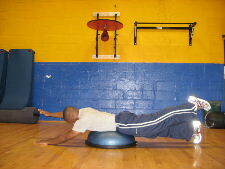 Below are some back exercises on the Bosu Ball. 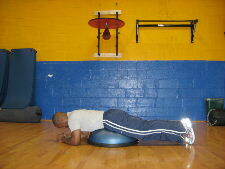 Starting Position: Begin by lying face down on the Bosu Ball with your arms straight overhead. Form: Exhale and lift your right arm and left leg off the floor. Hold briefly at the top of the motion and then slowly return to the starting position. Personal Trainer Tips: Move in a slow and controlled manner. Focus on engaging your glutes (hips), lower back muscles, and shoulder muscles. Push into the range of motion until your body is at least parallel. 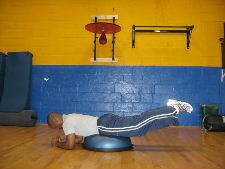 This exercise is similar to reverse hyper-extensions on a regular exercise ball. However, it is much easier to balance on the Bosu Ball because it won't roll from underneath you. 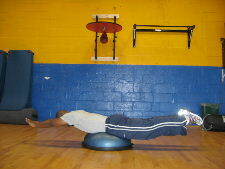 Starting Position: Begin by lying face down on the Bosu Ball with your elbows on the floor in front of you for balance. Form: Exhale and lift your legs off the floor. Hold at the top for a brief second and then slowly return to the starting position. Personal Trainer Tips: Move in a slow and controlled manner. The purpose of the exercise is not just to lift your legs quickly up in the air. 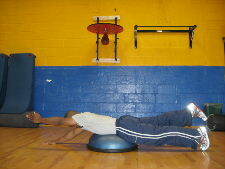 The purpose is to develop control and stability in the lower back by moving in a slow and controlled manner. The Full Super Man back extension is more difficult than the regular back extension because the arms are extended over your head. When the arms are overhead, there is a longer lever so more weight is placed on the lower back muscles, and your shoulder stabilizers must work harder to keep your arms overhead. 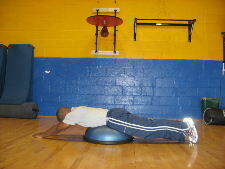 Starting Position: Begin by lying on the Bosu Ball with your arms straight over your head. Form: Keeping your arms straight over your head, exhale and lift your arms and legs off the floor. Hold briefly at the top and then slowly return to the starting position. Personal Trainer Tips: Focus on squeezing the glutes (hips) and working the lower back muscles. Move in a slow and controlled manner. Perform 8-15 repetitions and then rest. This back exercise also challenges your balance. You must make sure that you are positioned on the ball so that you can maintain your balance as you lift off the floor. Low back strengthening exercises can be done on the floor, a full exercise ball, or even the Bosu ball. After working your lower back muscles, it is a good idea to stretch your lower back. The Bosu Ball is a good piece of core exercise equipment that can be used in a variety of ways, but if you don't have access to don't worry. The important point is to perform low back strengthening exercises on a regular basis to keep your core strong and your spine healthy.